Hello my Lovelies, its finally the weekend thank goodness. I hope you all have been well since we last spoke? I have had such a crazy busy day today running errands so feeling very productive but starting to get that afternoon tired feeling. I went to see my parents, had my car washed, food shopping and made some lunch so it's nice to sit down for 5 mins and take a breather. If I could live anywhere it would defiantly be Greece, I am half greek and would go back every summer for the holidays and live with my aunt and uncle. I loved those times and all the memories that I have made it was fantastic. Now that I am older I have travelled around the islands a bit more and I just love the country and feel so at home. Now this is an easy one I used to try and draw my dream home when I was a child so many times I think it is now engraved in my brain, has anyone else done that or is it just me? I would love a large house I would say 6/7 bedrooms, set on a large piece of open land with a long driveway. I would want large double front doors leading into a open hallway with those split staircases that meet in the middle in front of you. Each room would have to have high ceilings and tall windows to let in lots of light, and of course outside would have to have pool/bar area and tennis courts. Some of the things I mention above being the pool and tennis courts, but I would also love to have stables and paddock for horses, and track area to go quad biking and a beautiful lake running through for peaceful summer afternoons where you can just listen to the animals and river running past which to me is so soothing. If I could be on holiday I would be travelling the world, I couldn't stick to one place. I would be road tripping around America which is a dream of mine, and seeing more of Europe and have time to spend in places to really get a feel for the culture and the people. If I could have any job right now it would be to be blogging full time and to have my own small boutique shop. I would love to help more people with my fitness side of things and help people get into shape and be the best person they can be. This is a hard one, there are so many things that I would love to be able to do. I would love to be able to talk to my dog for starters because I feel like he would have so much to say and also to be a fly on the wall and have the ability to listen to others conversations without them realising. That was so much fun, and great to be able to disappear into your own world for a while and dream big. I now these people to carry on the tag and if you want to give it a go for yourself be sure to join in and tag me or leave a comment below with your answers. I've never seen anyone do this tag before so I found it really interesting to read. 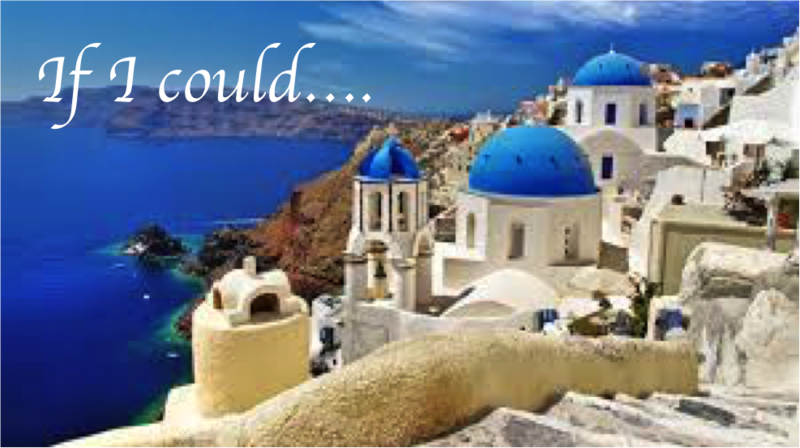 I would so love to live in Greece, particularly any of the Greek Islands. I love the vibe there and let's be honest, the food! Greek food is amazing.